World Press Photo 2012 Winner: the photo is wonderful but how does it serve our understanding? This year’s World Press Photo winner is Spanish photographer Samuel Aranda and his picture of a Yemeni mother holding her son, wounded during protests against president Saleh. After winning the award, the photo was subject to a lot of debate and criticism, mainly because its composition has been likened to Michelangelo’s Pieta and also because of its Renaissance style of lighting. 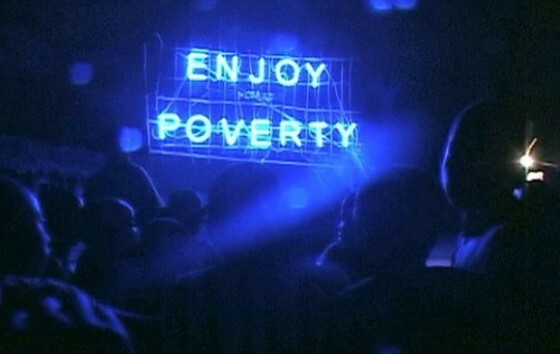 Enjoy Poverty is a documentary filmed in the Democratic Republic of Congo by Dutch artist Renzo Martens. The film shows how poverty is probably the most important ‘natural’ resource in Congo, as development aid brings in the country more money (1.9 billion US dollars) than the exploitation of natural resources such as copper and diamonds. But that’s not all, the film shows that the ones benefiting from this poverty in Congo are not the poor. Their situation stays the same year after year. The ones benefiting are the photographers paid to take pictures of starving children and the ‘corporate’ humanitarian organizations and also the rich people who are being paid high salaries to stop poverty. In the end it is no one’s interest to really eradicate poverty.